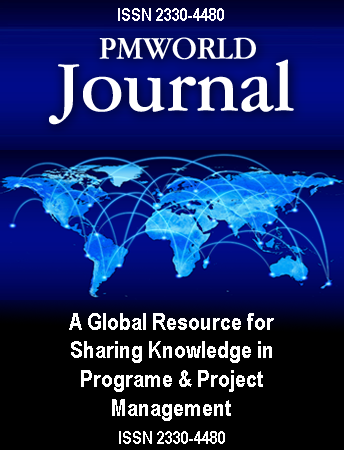 The PM World Journal (PMWJ) is published by and this website is owned by PM World, Inc., a US corporation. The terms of usage outlined below are intended to clarify the rights and responsibilities of the publisher and the readers who visit the website. The site may contain text, images, photos, graphics and other features (the “content”) provided by the publisher and various authors, contributors, advertisers and sponsors. Please read the information below. By accessing the PMWJ website, you indicate your acknowledgment and acceptance of the policies, terms and conditions expressed herein. Please check the paragraphs below periodically for changes. Your continued use of www.pmworldjournal.net following the posting of changes to these terms acknowledges acceptance of those changes. These terms are not intended to be onerous, just necessary to clarify some legal issues associated with publishing on a public website. Users accessing the PMWJ website do so at their own risk and PM World, Inc. is not responsible for material viewed or downloaded by Users from the Internet. The PMWJ website includes links to other web sites, often provided by the authors of articles, papers and other contents. Neither PMWJ nor PM World Inc. is responsible for the availability of those external sites nor does it endorse or is it responsible for the content made available on or through such external sites. The contents of and articles, papers or contents of this website do not necessarily reflect the opinions of the editor, PMWJ or PM World Inc. Neither PMWJ nor PM World Inc is responsible for the accuracy or reliability of any contents, or of third party or external websites. PM World Inc. does not guarantee or warrant error-free, interruption-free, secure or timely access to this website. We expressly disclaim any warranty of fitness of this website and its contents for any particular purpose or non-infringement. Neither PMWJ nor PM World Inc., nor their officers, employees or agents shall be liable for any direct, indirect, incidental or consequential damages resulting from (a) any bugs, viruses or the like that may be transmitted to or through this website; (b) any personal injury or damages; (c) unauthorized access or use of this website: (d) any errors, omissions, insults or libel in any content or for any loss or damage of any kind incurred as a result of your access and use of the website, to the fullest extent of applicable law. Click here to see the PMWJ Copyright, Trademarks and Intellectual Property Policy. Click here to see the PMWJ Author Copyright Policy. Readers are welcome to download and copy any contents of the PMWJ website for personal and educational usage. Copying for mass distribution or commercial use, including the packaging for PMWJ contents into training materials by paid courses, is prohibited without the express written consent of the authors and the Managing Editor of the PMWJ. Please refer to our Author Copyright Policy and the Copyright, Trademarks and Intellectual Property Policy for further rights related to downloading and printing PMWJ materials. The PMWJ website may provide, or third parties may provide, links to other websites or resources. We do not endorse and are not responsible or liable for any content, advertising, products, or other materials on, or available from, such websites or resources. Readers agree that neither PMWJ nor PM World Inc. shall be responsible or liable, directly or indirectly, for any damage or loss caused or alleged to be caused by or in connection with use of or reliance on any such content, goods or services available on or through any such website or resource. Any business dealings with, or participation in promotions of, advertisers, sponsors or organizations found on or through the PMWJ website, including payment and delivery of related goods or services, and any other terms, conditions, warranties or representations associated with such dealings, are solely between the User and such advertiser or Sponsor. Readers agree that neither PMWJ nor PM World Inc. shall be responsible or liable for any loss or damage of any sort incurred as the result of any such dealings or as the result of the presence of such advertisers on the PMWJ web site. The PMWJ website may provide links to other Internet websites that are not under the control of PM World, Inc. Neither PMWJ nor PM World Inc assumes any responsibility for the content of any such linked Internet website. A link to an Internet website should not be considered an endorsement by PMWJ or PM World, Inc. External and third party websites are not checked or monitored for accuracy or completeness by PM World Inc. The existence of a link between this Site and any other Internet website is not and shall not be understood to be an endorsement by PMWJ or PM World, Inc. No material, substance, information or owner or proprietor of any linked Internet website shall imply nor create any relationship or endorsement between PMWJ, PM World, Inc. and the owner or proprietor of such linked website. Access to any other Internet sites linked to this website is at the user’s own risk. The owners, editors and producers of PMWJ will use their best efforts to respect the privacy of on-line visitors. Personal data and information is gathered only when voluntarily submitted by the visitor. That information is used solely for the operation of this website for internal purposes, and is not sold or transferred to third parties. Only visitors or subscribers who request e-mail will receive e-mail. Every user who visits this website does so at his or her own risk. The materials in this Site are provided “as is” and without warranties of any kind either express or implied including, but not limited to, the implied warranties of merchantability and fitness for a particular purpose, title, non-infringement, security or accuracy. Neither PMWJ, PM World, Inc., nor any other party involved in the creation, production or delivery of this website or whose materials or information appear in this website, will be liable for any damages or injury caused by, including but not limited to, any failure of performance, error, omission, interruption, defect, delay in operation of transmission, computer virus, line failure, technical inaccuracies, typographical errors or the inability to use the materials in this website, even if there is negligence on PM World, Inc.’s part or if an authorized PMWJ representative has been advised of the possibility of such damages, or both. The above limitation or exclusion may not apply to the extent that applicable law may not allow the limitation or exclusion of liability for incidental or consequential damages. In that event, PM World, Inc.’s total liability for all losses, damages, and causes of action (in contract, tort, including without limitation, negligence, or otherwise) will not be greater than the amount paid to access this Website. The “Help” section of your computer should allow you to make these adjustments. Readers who experience some difficulty are encouraged to contact editor@pmworldjournal.net. This website and it contents are for lawful purposes only. YOU AGREE THAT NO CONTENTS OR INFORMATION ON THIS WEBSITE WILL BE USED BY, TRANSFERRED TO OR COMMUNICATED WITH ANYONE ENGAGED IN ILLEGAL ACTIVITIES, INCLUDING ANY ACTIVITIES OR PROJECTS ASSOCIATED WITH BIOLOGICAL, CHEMICAL OR NUCLEAR WEAPONS, ACTS OF TERRORISM OR ANY CRIMINAL ACTIONS. These terms shall be governed by and construed in accordance with the laws of the United States of America, regardless of where the user is based. If any provision of these terms shall be unlawful, void, or for any reason unenforceable, then that provision shall be deemed severable from these terms and shall not affect the validity and enforceability of any remaining provisions. These Terms and Conditions may be revised at any time by updating this posting. Neither PMWJ nor PM World Inc makes any representation that materials on this website are appropriate or available for use in any location around the world. Those who choose to access this website do so on their own initiative and are responsible for compliance with local laws, including but not limited to export and import regulations. YOU AGREE THAT NO CONTENTS OR INFORMATION ON THIS WEBSITE WILL BE USED BY, TRANSFERRED TO OR COMMUNICATED WITH ANYONE ENGAGED IN ACTIVITEIS OR PROJECTS DEEMED UNLAWFUL BY THE GOVERNMENTS OF AUSTRALIA, CANADA, IRELAND, NEW ZEALAND, SOUTH AFRICA, THE UNITED KINGDOM, THE UNITED STATES OF AMERICA OR OTHER COUNTRIES GOVERNED BY TREATIES WITH THE UK OR USA THAT DEAL WITH SUCH CONTENTS OR INFORMATION. PM World, Inc. reserves the right to update this policy at any time. © PM World, Inc. All rights reserved.